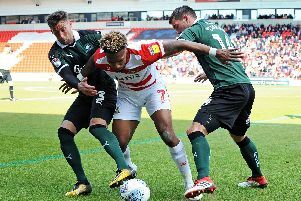 Doncaster Rovers might not have kept a clean sheet for ten successive League One games. But boss Grant McCann, whose side go to Coventry City tomorrow, is more concerned with his team finding the net first. “We're not ones for working a lot on defending,” said McCann. “We do, of course, work on it. “But our main plan of attack, week-by-week, is how are we going to open up the opposition and score goals. He added: “We never set out to just sit behind the ball and defend. We set out to score goals. “If we're going to be vulnerable to conceding then we need to make sure we score more than the opposition. “Of course, as a team, we would all like more clean sheets. “But the big message is getting the first goal. I think that gives us more belief to try and keep the ball out of our net. Teams then have to get at us which gives us a better chance of scoring again. Prior to Tuesday night’s 1-0 home defeat to Sunderland, Rovers conceded nine goals in three games. Their last clean sheet in the league was against Portsmouth on August 25. McCann’s men also paid the price for missed chances against the Black Cats and in the 3-3 draw with Gillingham. “We'll keep doing what we're doing. We'll work on what we think we need to improve,” said McCann. “One of those things is one v ones. We've missed quite a few this season. “What we’re good at is going from box-to-box at the moment. We've been outstanding. “We just need to finish off our chances and try and defend a little bit better. Rovers will face an in-form Sky Blues side without suspended defensive duo Andy Butler and Niall Mason. Tom Anderson will replace Butler, Matty Blair is likely to cover at right back and Jermaine Anderson and Ali Crawford are vying to start in midfield. “There's obviously going to be two changes and that's the reason why we've got a squad, for situations like this,” said McCann. “I think we've dealt with it quite well, with the Ben Whiteman suspension and the Joe Wright suspension, maybe with the exception of the Fleetwood game.